Our Review: "$200 cheaper than the new TaylorMade M2, the R15 brings an interesting value for money ratio. 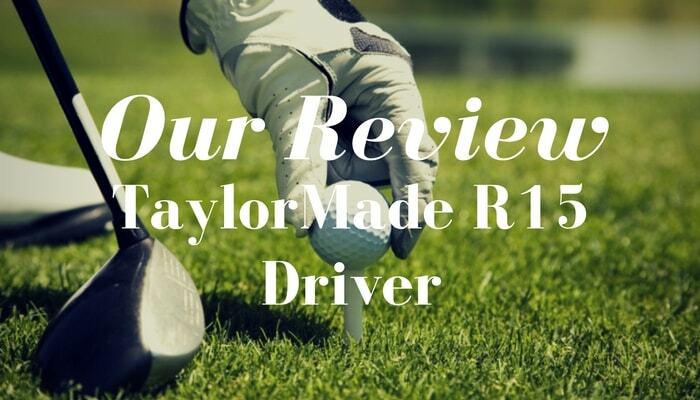 If you're looking to get the best driver for the price, the R15 has incredible qualities in terms of distance and technology that make it an attractive choice at this price." TaylorMade is certainly one of, if not the biggest name in golf equipment today, and has consistently produced high-quality golf clubs in over 15 years. Ask any golfer for their favorite driver, and we are sure that you will hear the TaylorMade R series many of times. The TaylorMade R is the stuff of legend, starting with the introduction of the R300 more than a decade ago. Since then, the R series continued to be the flagship series of TaylorMade, until surprisingly they ditched the R for the SLDR back in 2014, and today in 2016, they ditched the R again for the newer M1 and M2 series. 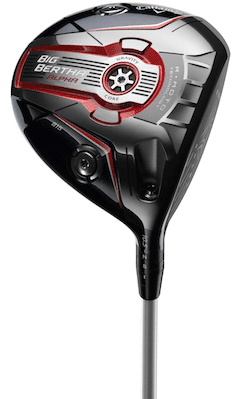 Thus, we will discuss the latest iteration of the R driver, which is the R15 Driver. In a world where newer golf equipment is always better (except very few exceptions), the 2016 M1 and M2 are obviously better than the R15, and the R15 is obviously better than the SLDR, w﻿hich was released 1-year prior in 2014. However, the question is, with almost $200 price difference between the M1 and the R15, would the differences in performance and quality justify the cost? The other question is whether the R15 lives up to the big name of the TaylorMade 'R' series, especially with the commercial failure (to TaylorMade Driver's standard) of its predecessor, the SLDR Driver. We will try to answer those questions, and dig deeper to all the key features, technologies, and characteristics of the TaylorMade R15 Driver. 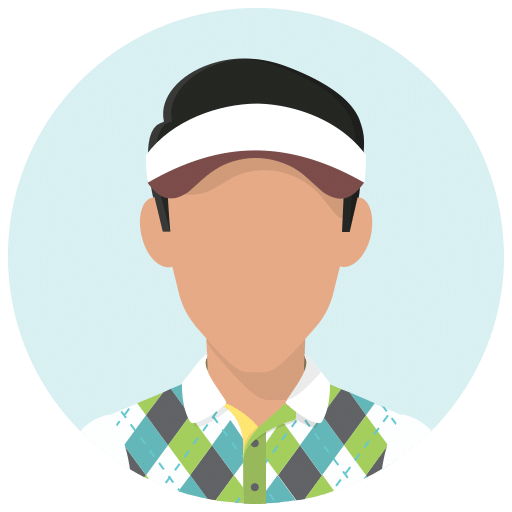 We understood that choosing a driver could be the hardest part in choosing your golf equipment, and we would certainly love to help you make a better purchase decision. Without further ado, let us first begin by discussing the Pros and Cons of the TaylorMade R15 Driver. Throughout this review, unless stated, we are referring to the 460cc version of the R15 Driver. 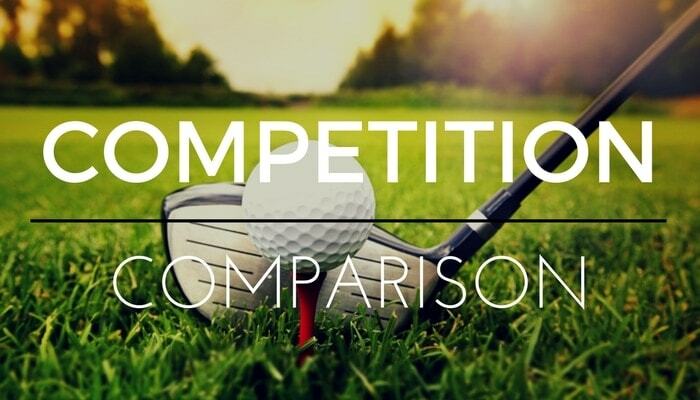 How does the TaylorMade R15 compare to the competition? Distance: TaylorMade has been known for the exceptional distances for their drivers, and the R15 lives up to that reputation by being one of the longer models available on the market right now. Feel: The R15 is one of, if not the best feeling driver TaylorMade has ever made. The feedback your R15 hits will give you are excellent, letting you know where you missed exactly. Looks: We absolutely love the white crown of the R15. Playability and Accuracy: With two 12.5-gram movable weights both at the toe and heel, the driver is very forgiving as even not perfect contacts will get the ball in the fairway. Designated for Better Players: the TaylorMade R15 is intended for professionals and high-level amateurs with single handicaps. Relatively Straight Shots: it is relatively hard to curve the balls with the R15. The center of gravity has been the hottest topics of golf equipment discussions in the past recent years. Yet, a lot of golfers still misunderstood the science behind it, and its importance in improving your plays. High Vs Low: Higher center of gravity will produce higher back spin, while lower center of gravity will produce the opposite. Left Vs Right: The closer to the heel, the center of gravity will produce more draw spin. On the other hand, the closer the center of gravity to the toe side, the less draw spin it will produce. If you are struggling with countering slices, look for a club with the center of gravity closer to the heel side. Front Vs Back: Front center of gravity, in general, will produce less amount of spin, and vice versa. Front center of gravity also improves launch trajectory and distance and is generally sought-after in modern golf clubs. The TaylorMade R15 Driver utilized a low-forward center of gravity closer to the heel side, first used by TaylorMade in their SLDR Driver. As a result, the R15 produces the lowest spin possible to increase distance, trajectory, and penetration, which are the three most important characters necessary in a golf driver. The real major improvement you will find on the TaylorMade R15 driver is the new Front Track system, which is a major overhaul from TaylorMade SLDR, its predecessor. The front track is not only longer, but TaylorMade adds a second, adjustable weight. As a comparison, the SLDR has only one 20g weight, while the R15 Driver has two 12.5. g weights. The Front Track is also closer to the front edge, by 12mm compared to the old SLDR. 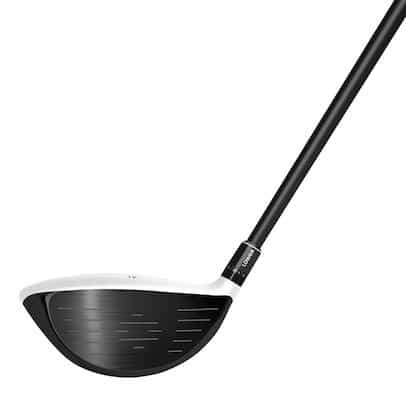 This design moves the center of gravity closer to the face while allowing the face to flex a bit more so you get less fall in ball speed, and moving the center of gravity 75% to the low-forward of the club. The result? Ball speed and distance. However, low-forward center of gravity clubs are known to be unforgiving in precision. TaylorMade's answer? The sliding split weights technology. Although it wasn't the most successful -commercial wise- of TaylorMade drivers, we personally loved the TaylorMade SLDR for its precision with higher swing speeds. However, if your swing speed is not sufficient, the SLDR's performance will suffer a lot. TaylorMade tackled that issue by adding additional weight and made them adjustable by sliding. You can simply unscrew the weights with the supplied wrench, and slide them to the heel for more draw, or to the toe for more fade. Putting both weights in the middle will produce similar effects to the SLDR. With the mass directly behind the ball, your strike will be more solid, and with high enough swing speed, you will gain exceptional distance with this setting. Putting both weights to the heel will change your straight shots to a draw in a reasonably subtle manner. On the other hand, putting both weights to the toe will subtly change your shots to fade. Splitting the weights to both ends will produce more spin and slightly increase trajectory. The overall stability of the head will increase in this setting, and as the result, will increase the forgiveness of the driver. 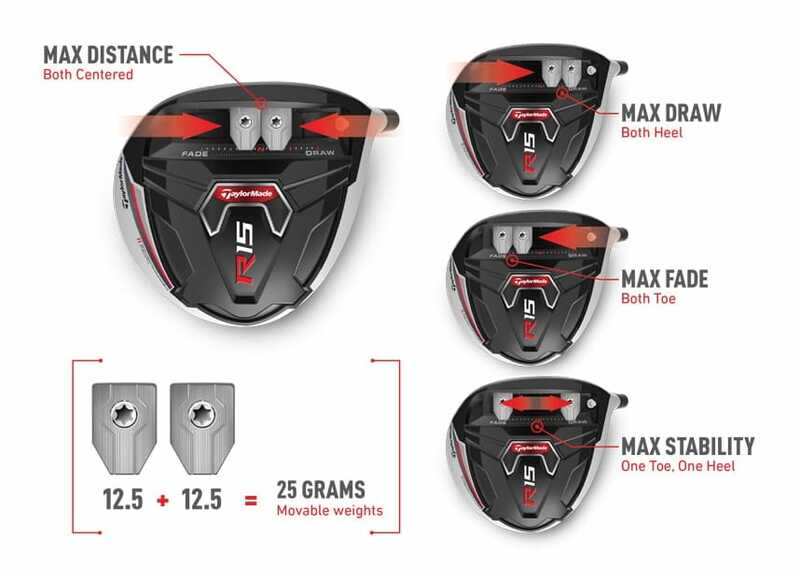 With the R15 driver, you will have the option to adjust and tighten the weights at any point, making your total options to 21 possible choices. 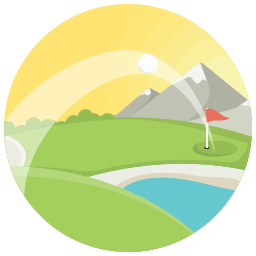 This will allow you to fully fine-tune the center of gravity to your playstyle and preference, and in our opinion, personalization will make the best club for you. 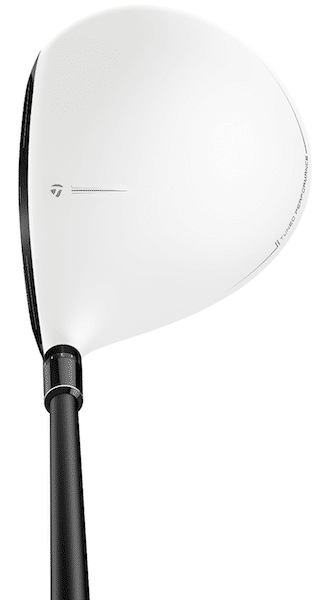 The shaft of the TaylorMade R15 Driver is the Fujikura Speeder 57g with the manageable length of 45.5 inches. The Fujikura Speeder 57g was utilized in the TaylorMade SLDR, and was one of the best things about the SLDR. Fujikura is certainly one of, if not the biggest name for golf shafts, and the lightweight Speeder 57 will help with a higher trajectory and speed, essential for a driver performance. While the shaft of the TaylorMade R15 is identical to SLDR, the grip is a major upgrade from the already superb TaylorMade 360 used in the SLDR. For the R15 Driver, TaylorMade utilized the Lamkin UTx grip, which in our opinion, is one of the best all-weather grips available on the market today. The Lamkin UTx maintain a sufficient grip even in the rainiest of days, and while most all-weather grips tend to be uncomfortable, it's not the case with the UTx. It's also hard to find a grip with a comfortable level of shock absorption while maintaining response, and again, we felt that the Lamkin UTx finally achieved that holy grail of perfect balance between both. The Lamkin UTx is simply an excellent choice for the R15 Driver, maintaining a high level of grip and comfort throughout all weather conditions, sufficient amount of responses and feedbacks to your shots, and comfortable levels of shock absorptions. The R15 comes with a brand-new Front Track System, a lower center of gravity, adjustable weights and a new shaft and grip. Here we will compare various qualities of the 2014 SLDR, 2015 R15, and the 2016 M1. The M1, obviously, is the newer and the better of the bunch. However, let us see how the R15, with almost half the price, would differ in quality. Both the R15 and the SLDR drivers utilized similar shafts in the form of the Fujikura Speeder 57 with, as the name suggests, 57 grams of weight. The TaylorMade M1 utilized the Fujikura Pro 60 to replace the now discontinued Speeder 57. The newer Fujikura 2016 Pro is designed with a stiffened mid and tip, allowing more handling forgiveness. However, we actually prefer the Speeder 57 over the 2016 Pro 60, mainly because the Speeder is built with distance and penetration in mind, which we feel, is the core essential value for a driver. For driver's club head weight, lighter is definitely the better. While the R15 Driver shift from SLDR's Performance 360 to the Lamkin UTx grip, the M1 went back to the Performance 360, this time through a partnership with Lamkin. In our opinion, the UTx grip is more well-rounded, especially being an all-weather grip. However, the Performance 360 provides a better overall response in dry weathers. Both are excellent grips, but we prefer the UTx for its excellence in all weather conditions. First of all, the crown and overall club head weight are lighter, due to the usage of carbon composite material for the crown. The lighter weight meant an even lower center of gravity, improving launch conditions. Second major improvement is the adjustable weight. Now the M1 have an even more customizable weight setting by using two separate weight tracks, the front, and the back track. The front track alone has 18 sliding positions, while the back track has 15. This means 270 possible combinations compared to the 21 found on the R15 Driver. An obvious improvement to forgiveness and personalization for the M1 vs R15, but will the extra cost of $200 be justified? After we have discussed the various key characteristics and qualities, we have understood that the R15 Driver is an absolute improvement over the older SLDR. The R15 Driver is also a better commercial success and is very popular among professionals and amateurs alike. However, the release of the newer M1 (and M2) Drivers in a relatively short manner complicates many golfer's decision. Those with the R15 Driver are hesitant to upgrade to the M1 or M2, while those looking for a new driver are confused about which one to buy. The M1 is absolutely a better driver, as well as the M2 for those who prefer lightweight drivers. However, with almost $200 price difference, we personally felt that the M1 and M2 are not enough improvements over the cheaper R15. Stay tuned for our full review for the M1 and M2 drivers. For now, let us dig deeper into our takes of the R15 driver. In the same category of drivers, we've also reviewed the Callaway XR 16 Driver. We have discussed some of the major improvements in technology in our key features section above. However, now let us dig deeper into the key technologies of the R15 Driver. We have discussed how the R15 have a lower and more forward center of gravity (CG) compared to older TaylorMade drivers, especially the SLDR. The new overall design paired with the new Front Track technology, allows 40 grams of weight shifted closer to the face compared to the SLDR, which already has the low-forward CG philosophy as its base principle of design. As a result, the R15 Driver is significantly better in ball speed and distance (test data below). 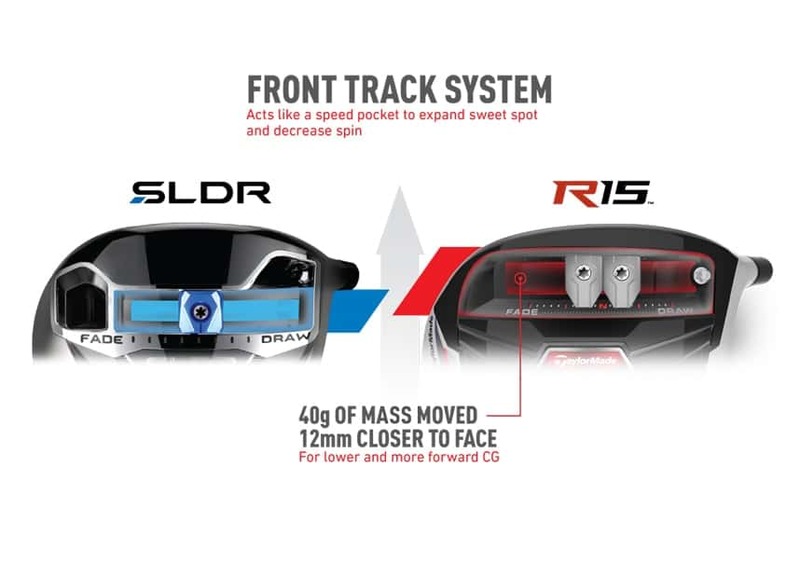 We also have discussed the basics of the new Front Track system of the R15 Driver, and as we promised above, let us dig deeper into the subject. For example, during our tests on trackman, the Max Stability setting will increase the ball spin around 300 RPM, and roughly 6% of height trajectory increase compared to the Max Distance setting. 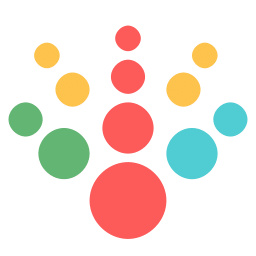 The changes with each of the 21 position are significant yet reasonably subtle enough so that you can still control your game. The Ultra Thin Casting technology saves the overall weight of the club, lowering the weight of about 4 grams compared to the older SLDR model. Four-gram difference is very significant in the world of driver equipment, as it will mean a lot to the overall ball speed and distance. The R15 also utilized an improved Inverted Cone Technology, allowing an optimized and expanded sweet spot. This partially contributes to the overall forgiveness of the club compared to the SLDR model, as your mishits will become less frequent with a larger sweet spot. The Inverted Cone Technology has been around for some time on TaylorMade clubs, but it is significantly improved in the R15 series. We have discussed how forgiveness is a key improvement on the R15 compared to the SLDR, and now we will discuss why. The SLDR, by itself, is a superb driver with excellent distance gain and ball speed. However, its rather unforgiving nature made the SLDR a bit of a commercial failure compared to older TaylorMade flagship drivers. Furthermore, the SLDR is unforgiving in both key areas: swing speed and mishits. With insufficient swing speed or mishit, or both, the performance in distance, ball speed, and even shape will be reduced dramatically. Yes, the front track system already improves the overall forgiveness by its positioning alone. Positioned 12mm closer to the clubface, compared to the SLDR, the center of gravity is moved further lower and forward. The channel now acts like a speed pocket to allow the club face to flex. You will get less decrease in ball speed, and hence you will lose less distance on mishits. This feature will also help golfers with insufficient swing speeds, as you will still gain exceptional distance compared to the SLDR. The R15 is larger in profile, and the white crown color simply helps with alignment. 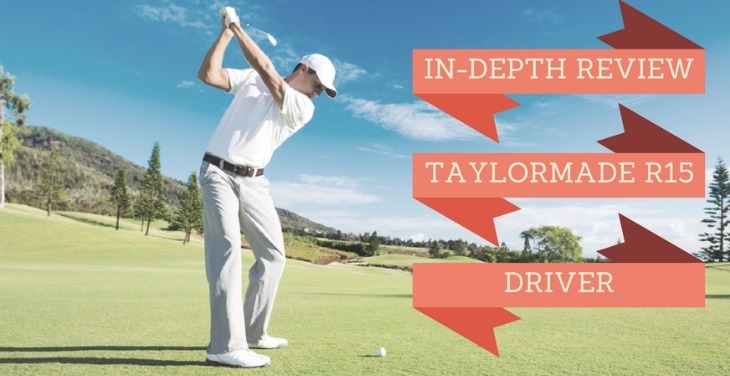 These characteristics will help you hit the center more often, indirectly affecting the forgiveness of the driver. 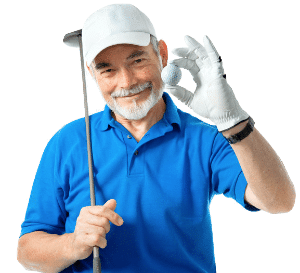 Performance and in this case, misperformance is often a product of a golfer's habit, hence, in general, every golfer will need different clubs and equipment that cater their habits and preferences. Thus, the personalization feature of the new front track system of the R15 Driver is certainly welcomed. Having trouble with swing speed? Set the adjustable weight to maximum distance mode. Need help with mishits? Set it to the maximum stability. With 21 personalization settings on the TaylorMade R15, you can experiment and find your preferred setting so that the forgiveness of the club will suit your exact needs. The 460cc version of R15 came in two color selections, black and white matte, while the 430cc only came in white. TaylorMade is known for sporty, minimalist, and edgy designs, and the R15 emphasized those values even more. We have discussed that we personally liked the white crown color with a black face on the R15, mainly because the contrast will help with alignment besides its aesthetics purpose. The head is relatively big, but not as bulky as previous TaylorMade clubs, which is a welcomed change. We liked how the crown, especially the white one is relatively clean with only the gray 'T' logo and alignment mark found. We liked the alignment mark placement and how it is extended further compared to other competitors. For the R15 Driver, how it feels will depend on how you customize it, but first, let us discuss how we liked that the sound it produces is a major improvement from high-pitched sounds TaylorMade drivers made in the past. Moving back to customization, first, there are two selections of head size. The 430CC came with 4 loft selections from 9.5, 10.5. and 12 degrees, and the 460CC with an additional 14 degrees loft selection. The sleeve came with 12 positions of over 3 degrees launch angle adjustability, and finally, the customizable Front Track System we have discussed throughout this review. How would the R15 Driver ultimately feel? The answer could be: exactly how you want it! Start by choosing the right head, custom fit the right loft, and experiment with your weight settings to get the best out of the R15 Driver. 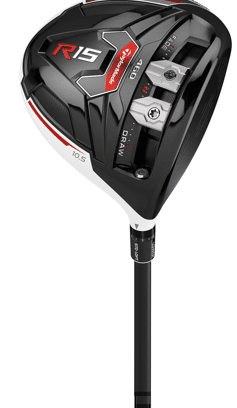 The R15 Driver is a definite improvement over the SLDR in the performance category. During our tests, the numbers have shown that the 'split' maximum stability setting will indeed affect forgiveness and stability by providing more spin while lessening the ball speed and height trajectory. We understood that many golfers (ourselves included, initially), have felt that 'lofting up' is just a marketing jargon to add a useless feature to newer clubs and drivers. 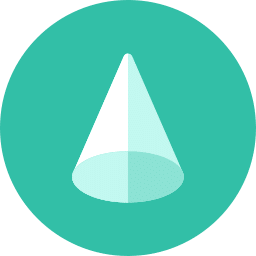 However, during our tests, we found out that increasing the loft angle will indeed affect launch, maximizing your launch conditions in the process. The recent trend within the PGA Tour to loft up has indeed proven the point as well. We have stated several times that customization and personalization are certainly strong features of this driver, and the loft angle setting should certainly be embraced to maximize your performance. 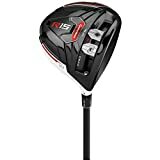 Would the R15 Driver be a decent choice for the driving range? Absolutely. The performance in distance is superb, the design, looks, and feel are excellent, and bringing a TaylorMade driver to the driving range will not only boost your confidence but could be a major difference in earning your status in the driving range. During our tests with the 460cc head, we hit some drives that struck the 300-yard mark without a strong wind on our back, which was a rarity with the TaylorMade SLDR, as well as other drivers from similar price range. For those who prefer lower-spinning driver and more compact size, the 430cc version might be a better choice. Golfers with high swing speed and accuracy that will consistently hit the sweet spot will find the low spin and extremely long distance of the R15 astonishing. However, even if you missed the sweet spot, the low-forward center of gravity and the customizable weight setting of the Front Track System will ensure enough forgiveness compared to other drivers available on the market. In this section, we will compare the TaylorMade R15 Driver to several other comparable drivers available on the market. We have done several comparisons to the TaylorMade SLDR, and TaylorMade M1 throughout the article, so we will not repeat it again here. Instead, we will compare the R15 Driver with the TaylorMade AeroBurner, the Titleist 915D2 and the Callaway Big Bertha Alpha 815 DBD. Our Verdict: Overall, the R15 won in almost every category, providing more distance, less spin, and better consistency. The Aeroburner, however, is roughly $100 cheaper. 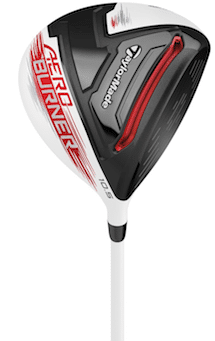 The TaylorMade Aeroburner could be a decent, more affordable alternative to the R15. Its main weakness is its shaft, however, and you might want a replacement shaft which might be costly. Our Verdict: The R15 Driver has better maximum distance, and on precise hits, will always win over the 915D3 in the distance category. 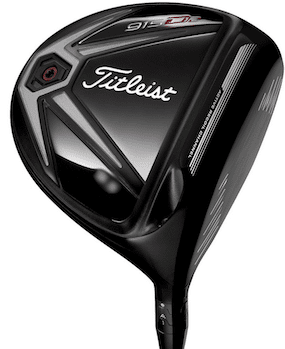 However, the 915D2 is more forgiving (less forgiving in Titleist 915D3). For distance, got for R15, for overall performance and forgiveness, the 915D2 is better. Our Verdict: TaylorMade VS Callaway has often been cited as the biggest rivalry in golf, and to be honest, we felt these two drivers are so similar to each other it will be really tough to choose just one. Here is our final verdict; the BBA 815 produces less overall spin, and on higher swing speeds (100mph and above) will hit longer distance (2-3 yards difference), on lower swing speeds the R15 Driver hits longer distance (1 yards difference). A tie.